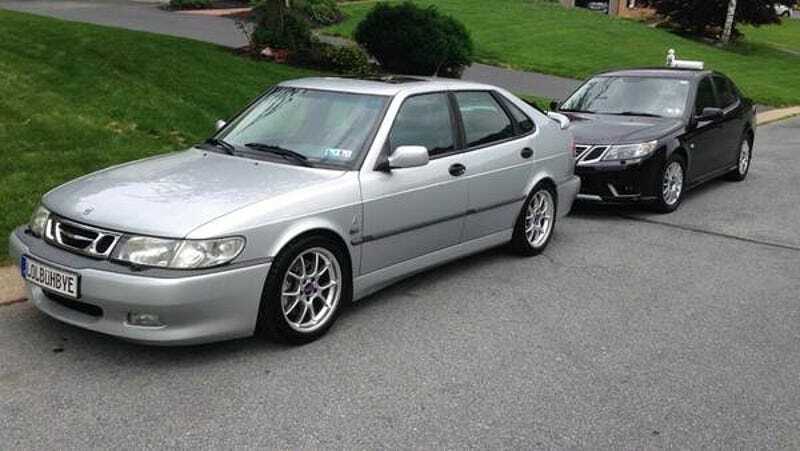 How About This Clean 2000 Saab 9-3 Viggen For $6,500? While Saab was supposedly born of jets, the company died due to rocketing debts. In between they built today’s Nice Price or Crack Pipe Viggen. Let’s see how well it’s held up. Fully 70% of you felt that twenty-four grand was too high a price for a hand-built wooden car and its trailer. Contrastingly, a splinter group felt they wouldn’t mind paying that much to lumber around. They thought the rest of you simply couldn’t see the forest for the freakin’ trees. There are a lot of trees in Sweden, and in fact its national tree is the majestic Ornasbjork or silver birch tree. By some magical happenstance today’s 2000 Saab 9-3 Viggen is also both Swedish and silver. The Viggen was Saab’s M3, a raucous and rabid performance upgrade that offered Swedish Bikini Team in a can-levels of fun over the standard car. It packed a modestly-sized motor—2.3-litres—partnered with a honkin’ big turbo to make the life of the front tires a short and tortured affair. In between the mill and the meats is a five-speed manual with a somewhat rubbery action, and the whole works is bolted to a modded GM900 platform, shared with cars like the Opel Vectra and Saturn Aura. Much hay has been made about how these were the fastest Saabs short of those with delta wings and an ejection seat, and this silver over black edition, with its model-specific bodywork, has some nice show to back up the go. Mid-sized five-door hatchbacks with enough power to make understeer interesting are not all that common today, at least ones that are cars and not butched-up crossovers. That make this 9-3 an interesting blast from the recent and more car-centric past. That past of course is now 16 years old, and there’s the matter of 172,000 miles that have been accumulated along the way. Despite the age and miles, this Saab still presents pretty well in the pics. The paint seems to have held up, and the interior looks amazingly wear-free. As a bonus, the car comes with a clean title and the claim of being accident-free. Oh yeah, and just like on a Viking Long boat, the ignition’s between the seats. This Viggen also comes with a ton of money having been thrown at it not all that long ago. If you’re worried about the mechanicals, then relax with the knowledge that much of what makes this super Swede go has been recently renewed or improved. The ad offers two lists—both of which are pretty long—denoting maintenance and upgrades made to the car. Those includes a whole top-end rebuild and an aftermarket chip that the seller claims is tuned for more than 300 ponies. Keep in mind those all go through the front wheels. That’s kind of a head scratcher, and makes you wonder, why isn’t this sweet silver bullet getting the love it deserves? Is there something the seller isn’t telling us? Is the market for Viggens so saturated that supply has far outstripped demand? Or, has this car just not met a sufficiently appreciative audience yet? We’ll just have to work with what we’ve got and what that is happens to be the info in the ad and that $6,500 price. Taken together, what’s your opinion on this Viggen’s value? Does $6,500 seem a fair price for this famous Saab? Or, is that too much for even for a Viggen? Lancaster PA Craigslist, or go here if the ad disappears. H/T to chicagoE36 for the hookup!